This is some kind of very cool offer. Go through the details to know everything and the procedure. Reliance Communications, one of the largest telecom providers in India has introduced an excellent and unique offer for its Netconnect prepaid subscribers. Reliance will offer data upto 1GB/month for free and will be valid for lifetime. All that will happen with just a recharge of Rs. 3001. 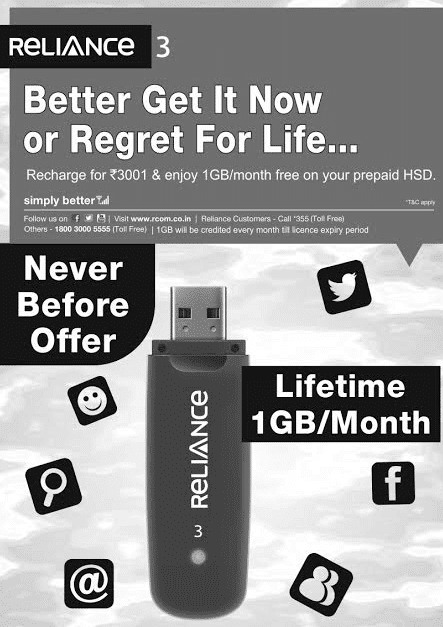 After recharge subscribers will be credited 1GB/month for lifetime or till license expiry date. Reliance NetConnect offers speeds up to 14.7Mbps on its Rev B network and up to 3.1Mbps on its Rev A network. All India roaming is available on all Netconnect plans over RCom’s CDMA network all around the nation. Reliance has been aggressive with Reliance NetConnect EVDO service recently by launching new plans and upgrading its CDMA network to Rev B, which was not available till now. But with this, Reliance will give a tough competition to the other EVDO enabled operators like BSNL, MTS and TATA DoCoMo. If you recharge with this now, you can expect to get 1GB data per month for lifetime, though it includes the offer upto the validity, so you can surf peacefully for at least five more years. If you are a Reliance NetConnect customer, grab this offer.